SEOUL, Oct. 11 (Yonhap) -- South Korea is not considering lifting its unilateral sanctions on North Korea which were imposed after the North's deadly attack on a South Korean warship in 2010, Seoul's unification minister said Thursday. "No detailed review (on lifting the sanctions) has been made," Cho Myoung-gyon told lawmakers during a government audit. "Still, in seeking inter-Korean exchanges and cooperation and amid improving relations between the two Koreas, we have been taking measures in a flexible manner." 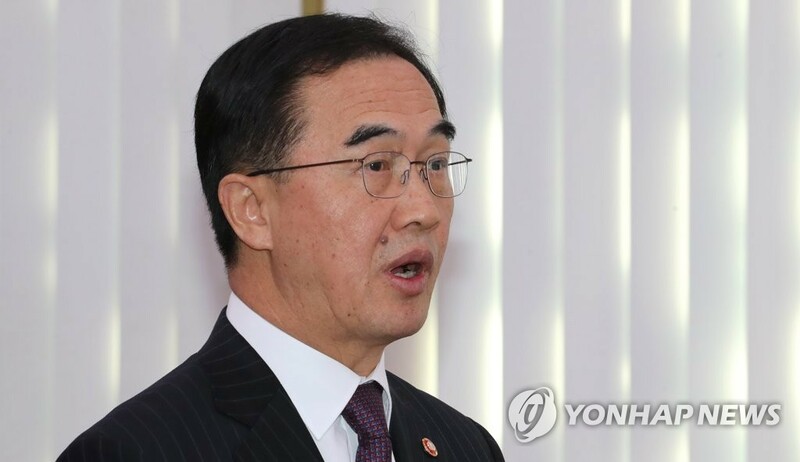 His remark came a day after Foreign Minister Kang Kyung-wha said that the government is reviewing whether to lift the sanctions imposed on the North after the North's deadly torpedo attack on a South Korean warship, the Cheonan, in 2010. Kang practically took back the remarks later, saying that there has been no intergovernmental review on the matter, in the face of criticism from lawmakers. Some urged her to demand an apology first from the North for the attack that killed 46 sailors. Pyongyang has denied its involvement in the sinking of the warship. "There should be relevant measures linked to the Cheonan warship incident, which caused us to impose the sanctions," Cho said in response to a question on what steps should be taken before lifting sanctions can be considered. The 2010 sanctions ban virtually all inter-Korean exchanges except for humanitarian assistance but experts say that keeping them might not have a practical impact as many of them overlap with global sanctions. South Korea has been eager to expand cross-border exchanges and cooperation with the North amid a growing sense of rapprochement on the Korean Peninsula. Sanctions are deemed a major impediment to seeking any economic cooperation with the North. The United States remains firm that no sanctions relief will come until the North completely gives up its nuclear weapons program. U.S. President Donald Trump has said that South Korea cannot lift sanctions without Washington's approval. Cho said that talks are under way with North Korea to arrange tours of economic facilities as part of preparations for full-blown cross-border cooperation down the road. He didn't elaborate on when and how such tours would be organized. With regard to the denuclearization issue, Cho expressed optimism that there will be "progress" when the leaders of the U.S. and North Korea meet again following their June summit in Singapore. The two earlier agreed to hold their second summit "at the earliest possible date." "(We) expect a certain amount of progress in the second summit between North Korea and the U.S.," Cho said. "When it comes to the results, there could be different expectations so we are preparing for all possible scenarios to keep inter-Korean relations, exchanges and cooperation going." "The North is also expected to make preparations for the second summit with the U.S. in consideration of what the international community demands and expects," he added. He said he expected North Korea to be more willing to cooperate with the international community this time, saying that the North's attitude appears to have changed. "In the past, (the North's objective) was self-reliance, but now the North emphasizes that it should go to the global level. This is a big change," he said. "In this sense, the thing that we could take away from the Pyongyang Declaration and the Oct. 4 joint event is that (the North) appears to be moving to cooperate with the international community," he added. Cho said that he felt the change in the North's attitude from his recent trips to North Korea for an inter-Korean summit in September and the joint celebration to mark the anniversary of a 2007 summit agreement.